A.C. Goodwin is known primarily for his luscious dock views, landscapes and cityscapes in and around Boston, Gloucester and New York City. He spent most of his professional life in Boston (before 1920 and from 1928-1929, and again from 1925-until his death) and New York City (1920-1927). He painted in oil and in pastel. Known as a “Boston painter,” he was a member of no “school” and basically was self-taught. He was a member of the Guild of Boston Artists and the Boston Society of Water Color Painters. He exhibited at the Guild of Boston Artists; the PAFA; Doll & Richards Gallery, Boston; Boston Art Club; Corcoran Gallery, Washington, DC; Milch Galleries, NYC and elsewhere. His work is represented at the Museum of Fine Arts, Boston; Union Club, Boston; St. Botolph Club, Boston; Addison Gallery of Art, Andover, MA; Colby College, ME and elsewhere. He painted en plein air and is best known for the Boston waterfront, street and park scenes. 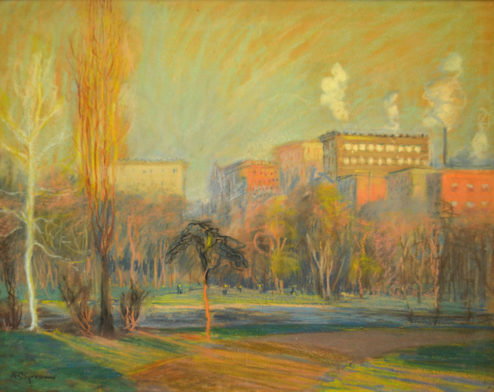 In 1920, Goodwin painted Washington Square in Manhattan from his studio there. After his marriage failed, the despondent artist returned to Boston and led the life of a Bohemian who drank excessively. Louis Kronberg often roomed with Goodwin, taking care of him and making sure he didn’t drink too much alcohol. Although Goodwin never studied in Paris, he vowed one day he would go to see the French Impressionists’ work firsthand. Tragically, after an excessive drinking binge, Goodwin was found dead in his Boston studio with tickets for Paris in his pocket. In 1974, the Museum of Fine Arts, Boston, honored the Impressionist with a solo show, and thereafter his works have been sought after and collected by the finest institutions and individual collectors throughout the world.